Alphonse was born in La Broquerie, Manitoba on November 16, 1894. He was living in Appledale, BC when he was drafted in January of 1918; however, homestead records indicate that he had filed on NW 31-78-20-W5 in 1917. Alphonse was sent overseas, but served only in England. His brothers, Antoine and Edouard, served in the Canadian Army as well. In December of 1918, Alphonse was dangerously ill with pneumonia and influenza. He survived and returned to Canada. In 1925, he filed on an additional quarter at NW 23-77-21-W5. Alphonse left the area in 1933 and moved to Vancouver. Antoine was born in La Broquerie, Manitoba on June 30, 1896. In 1917, he filed on a homestead at SW 31-78-20-W5, near Donnelly, AB, where he was living when he was drafted in June of 1918. Antoine served in England; his brothers, Alphonse and Edouard, served in the Canadian Army as well. In 1929, Antoine left Donnelly to work in British Columbia. Edouard was born in La Broquerie, Manitoba on December 6, 1890. He gave this as his current address when he was drafted in 1918. Unlike his brothers, Antoine and Alphonse, Edouard did not leave Canada. In January of 1919, he was demobilized and given "harvest leave," according to his service file. Edouard filed on a homestead at 16-78-22-W5. In 1930, he returned to Manitoba. William was born in Goderich, County Huron, Ontario on June 20, 1888. He enlisted in Harriston, Ontario in September of 1915. After the war, William came to the South Peace and filed on the southern half 27-80-8-W6. He filed on SE 32-80-8-W6 in 1929, but canceled this homestead. During the Second World War, William worked on the Alaska Highway. In 1959, he sold his land and moved to Spirit River. William died on March 9, 1965. James was born in Dumfriesshire, Scotland on August 14, 1886. In June of 1915, he filed on a homestead at NE 6-71-6-W6. Two months later, he enlisted in the Canadian Army. A newspaper clipping indicates that he was wounded in action; however, James's service file mentions no such injury, only that he suffered from myalgia. He returned to the South Peace in February of 1919. That spring he filed on a second quarter at SE 35-70-7-W6. James died on July 3, 1935. Charles was born in Shellmouth, Manitoba on May 17, 1893. He was still living in Manitoba at the beginning of the war, and traveled to Valcartier to enlist in September of 1914. On May 15, 1915, Charles went missing at Ypres. He was reported as a prisoner of war on June 24, 1915; he had received shrapnel wounds to his right thigh and knee. Charles's prisoner of war records indicate that he was moved around to about six different POW camps. On January 2, 1919, he arrived back in England. In 1927, Charles filed on a homestead at NE 15-73-12-W6. During World War II, Charles once again served in the Canadian Army, this time serving in Canada and the Caribbean. Charles died in 1965. Arthur was born in North Bay, Ontario on July 30, 1885. He and his wife Hannah and their children were living in British Columbia at the time of his enlistment in August of 1915. In June of 1916, Arthur was buried by a shell at Ypres. This happened a second time a week later; he was buried for two hours. In July of 1917 he was buried by a shell for the third time. Not surprisingly, Arthur suffered from nervousness and shell shock; he was also unable to control his bladder, though this problem was resolved when he returned to Canada. Arthur was sent to England in March of 1918 and was invalided to Canada in September. It is uncertain when his wife died, but according to the homestead record, Arthur was unmarried when he filed on SE 23-71-2-W6 and NW 24-71-2-W6 in 1930. He eventually cancelled these homesteads. At some point in the 1930s, Arthur married Evelyn and they moved to Grande Prairie with their children. During World War II, he was chairman of the Grande Prairie Salvage Committee which collected rags and rubber for the war effort. Arthur died on November 12, 1965. Stanley was born in Canterbury, England on August 12, 1886. It is uncertain when he immigrated to Canada, but at the time of his enlistment in September of 1914, he was living in Paddle River, Alberta. According to his service file, Stanley suffered from sciatica and neuritis. In May of 1918, he filed on SW 22-73-10-W6; some sources indicate that he also owned property at 11-73-10-W6 and 23-70-10-W6. He and his wife arrived in Grande Prairie in July of 1918. Stanley died on December 7, 1955. James was born in London, England on April 1, 1885. In April of 1914, he filed on a homestead at NE 8-73-10-W6. In March of 1915, James traveled to Edmonton to enlist in the Canadian Army. He was killed in action on March 25, 1916. 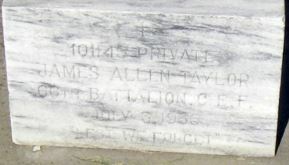 James's headstone in the Sanctuary Wood Cemetery in Belgium is inscribed with, "Their glory shall not be blotted out." John was born in Cheshire, England on November 12, 1887. In 1910, he filed on SW 7-72-6-W6 and the eastern half of 12-72-7-W6; he also filed on SE 13-72-7-W6 in 1912. 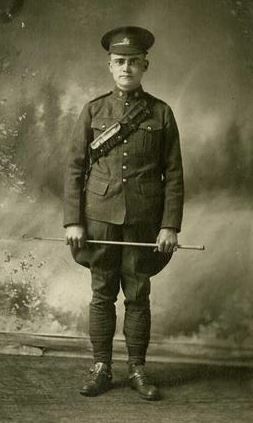 John enlisted in the Canadian Army in 1915. He was gassed several times, which affected his vision; the worst of these gas attacks was at Avion, France in August of 1917. John's hearing was also affected during his time in the trenches, and deteriorated after the winter of 1916. John died on April 8, 1955. John was born in Nottingham, England around 1891. He served in the Royal Army Veterinary Corps during World War I. In 1930, John came to the South Peace with his wife and daughter and filed on NW 13-75-13-W6 and SW 24-75-13-W6. Records indicate that he cancelled both homesteads. John died on January 7, 1932 at the age of 40. Duncan was born in Machrie Bay on the Isle of Arran in Scotland on March 23, 1890. At the time of his enlistment in the Canadian Army in November of 1917, he was living in Calgary. Duncan was awarded the Military Medal in April of 1918. He suffered from shell shock. After the war, Duncan emigrated to Nevada, where he worked in a mine. In 1919, he came to the Beaverlodge area and filed on SW 13-72-11-W6 and SW 24-72-11-W6. After proving up, Duncan returned to his work in the Nevada mine. He died a few years later. John was born in Grangemouth, Scotland on February 4, 1881. In 1914, he filed on a homestead at NE 5-74-8-W6. He enlisted in the Canadian Army in March of 1916. John did not return to the South Peace after the war. John was born in La Crosse, Wisconsin on November 4, 1865 (he lied about his age on his attestation paper and wrote 1870). He was living in Telegraph Creek, BC at the time of his enlistment in August of 1916. According to his medical records, John suffered from a hernia in April of 1918; he was not operated on until April of 1919. After the war, John filed on the southern half of 3-78-24-W5, as well as NW 3-78-24-W5 and SW 2-78-24-W5. He farmed until 1950, when he sold his land and moved into Grande Prairie. John died in Grande Prairie in 1962. George was born in Woodstock, Ontario on September 19, 1878. In 1911 he filed on a homestead at NW 35-71-8-W6. George enlisted in the Canadian Army in September of 1915. He returned to Lake Saskatoon in April of 1919, but a present address card in his service file indicates that George may have returned to Ontario in the early 1920s. Stanley was born in Ísafjörður, Iceland on October 10, 1892. He filed on SW 18-74-8-W6 in July of 1915. In November of 1915, he enlisted in the Canadian Army. Stanley was wounded on November 18, 1916 at 6:30 AM, twenty minutes after his battalion went over the top at the Somme. He suffered from shrapnel wounds to his right knee and the right side of his head. Stanley was moved two miles by stretcher, and invalided to Canada in March of 1917. On November 30, 1917, he was discharged, having been found medically unfit as a result of his injuries. In 1920/1921, Stanley filed on a second homestead at NW 8-74-9-W6. By this time, he was married to Dorothy Lettice Wilson. Stanley and Dorothy left the area in 1923. Stanley died on December 7, 1957. George was born Allainville, Ontario on February 13, 1893. He enlisted in the Canadian Army in June of 1915. On June 3, 1916 at Ypres, he suffered from severe shrapnel wounds to his chest, back, and leg as a result of an explosion. He was invalided to Canada in August 1917, having been found medically unfit. He was still walking with a cane at that time. In September of 1917, George fell while out walking, and broke a bone at the site of an old injury. On April 15, 1918, he was discharged. George filed on homesteads at NE 35-71-1-W6 and NW 36-71-1-W6 in 1919. He stayed in the DeBolt area for four or five years, then moved to Detroit for eight years before returning to the South Peace. George died in March of 1983. Robert was born in Pelee, Ontario in November of 1874. He owned a livery and restaurant in Lake Saskatoon village before the war. Robert enlisted in the Canadian Army in November of 1916. After the war, he filed on homesteads at NW 5-72-8-W6, SW 12-72-9-W6, and SW 8-72-8-W6. Robert died his hair in an attempt to look younger so he could enlist in World War II, but was sent home. 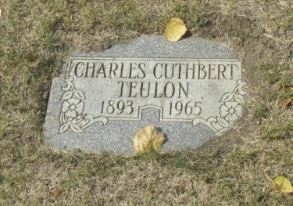 He died on August 10, 1948 and was buried in the Lake Saskatoon Cemetery. James was born in Codnor, Derbyshire, England on May 11, 1884. He worked as a coal miner as a young man in England. On September 13, 1911, James married Lily Smithard in England. They came to Canada in 1912, and James eventually filed on land at SW 8-71-6-W6 and NE 24-70-7-W6. By the time James enlisted in June of 1916, he and Lily had four children ranging in age from three months to four years. His brothers Joseph and William served as well. Jim died in Grande Prairie on May 10, 1961. Joseph was born in Codnor, Derbyshire, England on April 17, 1894. He came to Canada in 1912 and eventually filed on land at NW 22-71-5-W6 and SE 2-72-5-W6. In November of 1916, Joseph enlisted in the Canadian Army. His brothers James and William served as well. While serving in England, Joseph visited his old home in Derbyshire and married Nora Grainger, an old school friend. He brought his bride to Canada after being discharged in 1919. They raised five children. Joseph died on May 14, 1979. William was born in Codnor, Derbyshire, England on March 28, 1892. He came to Canada in 1911, leaving behind his sweetheart Ethel. In 1913, William filed on NE 33-71-6-W6. He enlisted in the Canadian Army in June of 1916. His brothers James and Joseph also served. While William was serving in England, he and Ethel were married. William was discharged on September 16, 1919, and the couple returned to Grande Prairie. Frank was born in Manchester, England on February 25, 1889. In 1914, he filed on a homestead at SE 14-71-10-W6. He enlisted in the Canadian Army in September of 1915. A year later, on September 27, 1916, Frank was found missing and presumed to have died. His body was found after the war and buried in the Serre Road Cemetery, Somme, France. Arthur was born ca. 1899/1900 in London. It is possible that he served in the British Army. Arthur filed on SE 10-72-1-W6 and NE 3-72-1-W6 in 1926. Sydney was born in Birmingham, England on October 28, 1883. He was living in Alberta when he enlisted in the Canadian Army in October of 1915. On March 21, 1917, Sydney suffered from shrapnel wounds to his right thigh (his tibia was fractured). His medical records note that this was an accidental injury; although this happened in France, it may not have been received while in action. In 1920, Sydney filed on NW 26-77-24-W5 and NE 27-77-24-W5. Louis was born in East Sherbrooke, Quebec on August 25, 1891. In 1915, he filed on SE 24-78-22-W5 near Falher. Louis was killed in action on September 1, 1918 and buried at Upton Wood Cemetery. Herman was born on December 8, 1894 in Kendrick, Idaho. In 1911, while he was a student at Alberta College, Herman filed on NW 26-71-8-W6. Herman was drafted into the Canadian Army in 1918, by which time he had proved up on his homestead. He was discharged on July 23, 1918 due to defective vision. On December 25, 1919, Herman married Beatrice Irene Burdick. They farmed very successfully in the Lake Saskatoon area and soon gained international recognition for growing prize winning grain. In 1931, Herman Trelle won not only the wheat crown, but world titles for oats, rye, flax and timothy. To achieve these distinctions during the Great Depression brought hope for a hungry world and world attention to the Trelles and the Peace River Country. Ironically, it was the Great Depression that saw the demise of the Trelle farm, which became so bogged down with debt that the family moved into Grande Prairie. When World War II broke out, Herman again enlisted with the Canadian Army and was stationed first in Calgary and then in Ottawa. He was discharged in 1943 for health reasons, and the family moved to California where he was to supervise an olive grove ranch. On September 2, 1945, he was shot by John Giliberti, a ranch foreman, while overseeing work in an olive grove. Herman is buried at Inglewood Cemetery, Los Angeles, California. Rosario was born in Kamloops, British Columbia on November 19, 1896. In 1912/1913, he filed on two homesteads at NW 9-78-14-W6 and NW 4-78-14-W6. Rosario enlisted in the Canadian Army on September 28, 1915, but was discharged on April 12, 1916, having been found medically unfit (cause uncertain). Then, in August of 1918, Rosario was drafted into the army. He served only in Canada. On December 13, 1918, he was discharged from the Canadian Army a second time. Percival was born in London, England on March 19, 1897. He came to Canada in May of 1914 to join his mother and elder brother in Ontario. In February of 1916, Percival enlisted in the Canadian Army. The Canadian Army Journal (see link below) gives a detailed account of Percival's involvement in the 38th Battalion's trench raid on February 22, 1917. He was sent to England to obtain his commission as an officer in January of 1918. In 1921, Percival filed on a homestead at NW 20-75-2-W6. A year or two later, he returned to Ontario. He came back to the Peace Country to visit his old homestead and the widow of his friend Victor Hurlock in 1972. Percival died in 1973. Charles was born in England on August 3, 1887. Charles came to Lake Saskatoon with Hugh Speke and Professor Green in 1912. They were Anglican missionaries and served in the church at Lake Saskatoon. In 1914, all three men returned to England to serve with the British Army. Charles was the only one of the three men to survive the war, although he was severely wounded. Charles was awarded the Military Cross "For conspicuous gallantry and ability on 13th May, 1915, when in charge of a trench to the east of Ypres. The troops on his right having been compelled to fall back owing to the destruction of their trench, Lieutenant Trevelyan with great skill reorganised the defence of his position and, although unsupported, succeeded in maintaining the safety of our line at a very critical time." In 1919, Charles graduated with a Master of Arts degree from Oxford. He served in churches in various parts of England until 1943. Charles married Maude Dorothe Dixey on December 30, 1930. They had two sons and two daughters. Charles died on March 24, 1974. Mention in "Rolling Around the World"
"For conspicuous gallantry. He led a party of bombers through the enemy's wire and inflicted severe loss on the enemy. Although wounded, he remained behind till all his men had got away from the wire." He was awarded a bar to his Military Cross on September 8, 1916. Also in September of 1916, Charles received a shrapnel wound to his left leg. Charles was killed in action on April 28, 1917. He was buried in the Ecoivres Military Cemetery in France. Mention in "Visiting the Fallen"
Wilfred was born in Hastings, England on June 4, 1885. In 1912, he filed on a homestead at SE 26-71-7-W6. Wilfred enlisted in the Canadian Army in Edmonton in November of 1915. He was reported wounded and missing before being officially recorded as having been killed in action on September 26, 1916. Trudeau , Francois Xavier Ignace "Frank"
Frank was born in Joliette, Quebec on July 31, 1877. In 1914, he filed on a homestead at SW 6-77-21-W5. Frank enlisted in the Canadian Army in September of 1915. In June of 1916, he was slightly wounded but remained on duty. Frank received a shrapnel wound to his right eye on June 11, 1917; not surprisingly, his vision was defective after this injury. He spent the rest of the war in England; it is uncertain in what capacity he served during this time. After the war, Frank returned to the South Peace and filed on a second quarter at NW 6-77-21-W5 in 1920. He died on October 23, 1930. Howard was born in Arthur, Ontario on October 15, 1882. In 1911, he filed on the northern half of 15-73-11-W6. Howard enlisted in the Canadian Army in February of 1916. In September of 1917, Howard received gunshot wounds to his thigh. He returned to duty on October 9, 1917. Howard was killed in action on November 10, 1917. Percy was born in Wickham St. Paul, England on March 9, 1896. It is unknown when he came to Canada, but he enlisted in the Canadian Army in July of 1915 (at 9:45 AM, as noted on his attestation paper). In March of 1919, he was given permission to marry Joy May. According to a present address card in his service file, Percy was living in England in 1922. 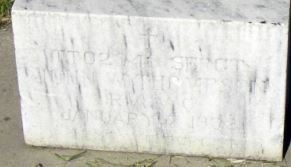 In 1935, he filed on the southern half of 19-72-26-W5; his homestead record indicates that he was unmarried at this time. 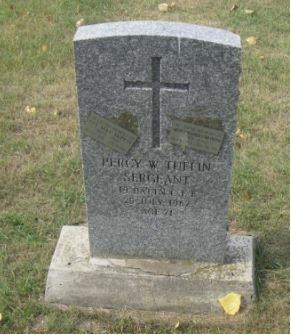 Percy died on July 25, 1967 and was buried in the Grande Prairie Cemetery. Oliver was born in Atkinson, Nebraska on April 8, 1891. In June of 1914, he filed on a homestead at SW 16-72-11-W6. He enlisted in the Canadian Army in July of 1915. Oliver was killed in action on April 12, 1917 and buried in the Thelus Military Cemetery. Charles was born in Chilliwack, British Columbia on December 7, 1891. He traveled to Valcartier to enlist in the Canadian Army in September of 1914. While serving in France, Charles was billeted at the Dubois home. He married daughter Jeanne in 1916. They made their home in England for a time, and their first son, Charles, was born on March 13, 1917. From February 1918 onward, Charles served only in England. In January of 1919, he spent some time at an RFC base. After the war, the Turners moved to Calgary, then to Bezanson, where Charles filed on the western half of 33-71-26-W5 in 1919, and finally into Grande Prairie around 1921. 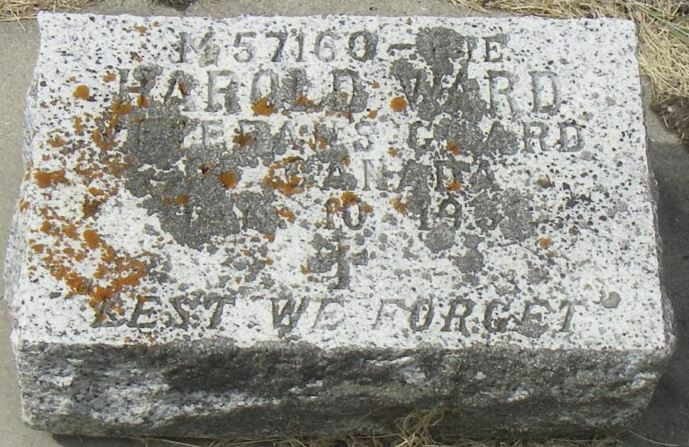 Charles died in early 1976 and was buried in the Grande Prairie Cemetery. Ralph was born on September 5, 1897 in Trenton, Nebraska. He came over the Edson Trail with his parents in 1912, and filed on NW 13-73-5-W6 in 1914. In June of 1918, Ralph was drafted into the Canadian Army. He was still in basic training in Canada when Armistice was signed. After the war, Ralph married Eva Collet of Buffalo Lakes. After retiring, they moved to the west coast, where they looked after lighthouses. Ralph died in May or June of 1961. William was born in St. John's, Newfoundland on June 25, 1894. He joined the Canadian Army in October of 1915. According to his pay sheets, William's pay was going to Miss Minnie MacKenzie in Ontario in 1917; there is no information concerning the nature of their relationship. William was awarded the Military Medal in 1919. Later in 1919, he filed on the southern half of 28-74-3-W6, though he canceled the southeast quarter. William filed on NE 21-74-3-W6 in 1921, and on NW 33-72-9-W6 in 1929, though he abandoned this property less than a year later. James was born in Ingersoll, Ontario on May 31, 1898. He filed on NW 19-71-4-W6 in 1916, and that same year enlisted in the Canadian Army. On October 11, 1918, James suffered from gunshot wounds to the chest while in the front lines at Cambrai. James died on September 26, 1927. Floyd was born on April 3, 1898 in Oldham, South Dakota. In 1911, he came to Alberta with his parents, and a year later he settled on NE 27-71-7-W6. Floyd was drafted into the Canadian Army in May of 1918. While teaching in Wetaskiwin, Floyd met Agnes Irvine. They were married in 1933 and had two children. Agnes died in 1974 and Floyd remarried to Jean Bunyan. Floyd died in Grande Prairie on January 25, 1982. Beatrice was born ca. 1863 in Odiham, Hampshire, England. Her husband, Alfred Harry Veitch, was killed in the Battle of Coronel on November 1, 1914, while serving as fleet paymaster on the HMS Good Hope. They had been married 24 years at that time, and had two grown daughters, Nesta and Hyacinth. Beatrice volunteered with the Red Cross, making surgical dressings. In 1928, she came to the South Peace with her daughter Nesta and her family, and filed on a homestead at NW 28-70-24-W5. In 1930 she filed on SW 32-70-24-W5. However, the records indicate that she later canceled on both homesteads. Bertus was born in Holland on April 6, 1897. His family came to the South Peace in 1913. In 1919, Bertus filed on SE 33-73-10-W6 (he later filed on SW 34-73-10-W6 and the southern half of 26-73-11-W6). He gave Hythe as his present address when he was drafted in June of 1918. Because it was so near the end of the war, Bertus served only in England. In 1931, Bertus married Edith Macie Pike. They raised their family in Hythe, where they lived all their lives. Bertus died 1988. Vernon was born in Costa, Washington on June 6, 1892. He enlisted in the Canadian Army in Calgary in May of 1915. A note dated August 1917 states that Vernon refused to write a will. In June of 1917, he suffered from Raynaud's disease; he also had trench foot in December of 1917. Vernon was invalided to Canada in February of 1918, and discharged on April 17, 1918, having been found medically unfit. In 1918, he filed on homesteads at NW 3-78-20-W5 and NW 9-78-20-W5. Vernon's wife's name was Cecilia. According to the present address card in his service file, Vernon's address in 1922 was Strathcona. Vernon died on June 26, 1963. Victor was born in Morton, Richland County, North Dakota on February 16, 1889. He served in the American Army during World War I. On September 14, 1918, Victor married Christine. They had four children. Victor and Christine lived in Saskatchewan until 1927, when they moved to the South Peace and settled in Sexsmith. They lived there for two years before moving to Deer Hill (northeast of Fairview). Victor died in Fairview in December of 1971. Sylvio was born in Ste. Anne des Plaines, Quebec on August 26, 1892. He enlisted in the Canadian Army on May 31, 1915. On April 28, 1916, Sylvio received shrapnel wounds to his left shoulder. He was awarded the Military Medal in late 1918. In 1919, Sylvio came to the South Peace and filed on land at SE 20-77-21-W5, NW 16-77-21-W5, and NW 22-76-21-W5. Fred was born in Clodden, Ontario on July 5, 1894. It is likely, however, that he lied about his age at enlistment; according to his service file, he stated at some point that he would actually be turning 19 in July of 1918. In this case, Fred would have been born in 1899. He was living in the South Peace at the time of his enlistment in July of 1915. Fred received gunshot wounds to the head on September 19, 1916 and suffered from compound fractures in his skull. He had shell shock, but later recovered. Fred died on December 4, 1957. George was born in Wiltshire, England on August 20, 1890. While working as a clerk for a shipping firm in London, a job opening came up in an office in British Guyana. George took the job, and worked his way up to overseer on the sugar cane plantation. At the time of his enlistment in 1916, George was living in Halifax. He injured his left foot and ankle in July of 1918 while unloading ammunition; a shell rolled onto his foot. After the war, George decided to immigrate to Canada. He settled in the Falher area and filed on the following homesteads: SE 3-76-21-W5, SW 2-76-21-W5, NE 35-75-21-W5, SW 34-75-21-W5, NE 34-75-21-W5. George died on May 1, 1955 and was buried in the McLennan Cemetery. Ernest was born in Quebec on September 17, 1878. He filed on NW 20-72-4-W6 in 1912; in addition to farming, he was also working on a government road. Ernest enlisted on March 13, 1916, but was discharged on July 7 that same year, before leaving Canada, having been found medically unfit. Charles "Hiram" Walker was born in Woodstock, Ontario on March 19, 1876. It is possible that he lied about his age when enlisting, as he was 47 when he filed on his homesteads in 1920 (The Big Bend states that he was born in 1874, and there is information in his military medical records indicating an earlier date of birth as well). Hiram served in the Boer War, then worked as schoolteacher in southern Alberta until he served in the Canadian Army during World War I. In August of 1917, he suffered from a slight shrapnel wound to his head. In 1920, Hiram filed on the southern half of 9-80-8-W6. He canceled this homestead, however, and in 1925 refiled by proxy on the southwest quarter while working as a mill foreman in Whitecourt. Hiram died in 1945. Jim was born in Monymusk, Scotland around 1887. He first came to Canada in 1919, likely after having served in the British Army during World War I. He met and married Ethel Crampton while working in Morse, Saskatchewan. They moved to British Columbia in the early 1920s, and to the Sexsmith area in 1928. Jim opened a bakery in Sexsmith, and later a second bakery in Fairview. Around 1940 the family moved to Fairview. Jim died on January 27, 1948. Lewis was born in Terherbert, Wales on March 14, 1891. His parents came to Canada and settled in the Three Hills area in 1914. Lewis enlisted in the Canadian Army in August of 1915; his brother Glyndwr was drafted into the army. He sprained his ankle in May of 1916. After being discharged, Lewis came to the MacHenry district to teach. In 1924, he married Clarice J. Thomas, a friend from Wales. They had two children, Margaret and Thomas. Clarice died shortly after Thomas's birth. Around 1930, Lewis married his housekeeper, Daisy Roberts. They continued to live in the MacHenry district. Lewis died on February 14, 1966. Glyn was born in Treherbert, Wales on March 2, 1896. He settled in the Sexsmith area in 1914. In June of 1918, Glyn was drafted into the Canadian Army. However, he deserted in October and never went overseas; his brother Lewis served in the Canadian Army. In 1919, Glyn filed on SE 7-74-11-W6. He canceled on this homestead, but filed on it once again in 1928 and this time proved up. In 1924, Glyn married Frances Quilley of Edmonton; they had three children. Glyn and Frances moved to Edmonton in 1972. Glyn died on March 23, 1975 and was buried in the Evergreen Memorial Gardens in Edmonton. Fred was born in Surrey, England around 1873. He filed on SW 26-7-8-W6 in 1910 at the age of 37. During World War I, he served in the British Army. Fred returned to Lake Saskatoon after the war and was very involved in the Anglican Church and the Lake Saskatoon Community Club. Around 1940, Fred moved to Fort St. John. He died in 1960. Alfred was born in Toronto, Ontario on June 13, 1897. He filed on SE 28-71-9-W6 in 1914. Alfred (as well as his brother Arthur) was drafted in June of 1918. He returned to the South Peace after the war. In 1954, Alfred was married. Alfred died in 1963 and was buried in the Beaverlodge Cemetery. Arthur was born in Toronto, Ontario on August 2, 1895. He filed on SW 5-72-9-W6 in 1913 (after the war, he also filed on the western half of 35-70-9-W6. Arthur (as well as his brother Alfred) was drafted in June of 1918. He served in England during the war, and in France with the Canadian War Graves Detachment following the war. Arthur once again served in the Canadian Army during World War II. In 1943, while overseas, he married Agnes Gibson. They returned to the South Peace in 1945 and settled in Beaverlodge. Arthur died on January 9, 1990 and was buried in the Beaverlodge Cemetery. Ben was born in Ontario on February 9, 1902; he lied on his attestation paper, stating that he had been born in 1898. He first enlisted in the Canadian Army in 1916 at the age of 14; he was living in Calgary at the time. He served in England, but was sent back to Canada in May of 1917 to convalesce after being ill with scarlet fever, mumps, and measles. Slight deafness in one ear worsened after this illness. Ben was discharged on October 31, 1917. In 1918, he and his twin brother Leonard joined the army without telling their parents, although they were significantly underage (see page 39 of Leonard's service file). Not surprisingly, their parents wanted the boys sent back home, as they were too young to have enlisted. Ben's parents had no idea which battalion he was with; they thought he might have joined up under a false name, but he had used his real name. He gave his parents' names as his next of kin; however, he said his parents lived in Seattle (they actually appear to have been living in Edmonton) on one set of paper work, and requested that communications be sent to a friend's address. While in Halifax in 1918, he received a knife wound to his left leg. It was the result of a "scuffle"; see pages 111 through 115 for a few different (and entertaining) testimonies concerning what took place. A note in the 1918 service file states that Ben was "not to be dispatched overseas till 19 years of age" (he was 16 at the time). After being discharged, Ben came to the South Peace and filed on the eastern half of 22-77-20-W5. He died on March 19, 1963. Leonard was born in Ontario on February 9, 1902 (he lied about his age on his enlistment form, stating that he'd been born in 1898). In 1918, he and his twin brother Ben joined the army without telling their parents, although they were significantly underage (see page 39 of Leonard's service file). Not surprisingly, their parents wanted the boys sent back home, as they were too young to have enlisted. Their mother wrote a letter dated May 17, 1918, requesting that her sons be discharged. Leonard was discovered to be underage in July of 1918, after he had reached England. He was sent back to Canada and officially discharged on November 24, 1918. In 1920, Leonard filed on SE 27-77-20-W5 and NE 33-77-20-W5. Leonard died on March 8, 1958. Harold was born in Scampton, Lincolnshire, England on May 30, 1895. He filed on NE 34-72-6-W6 in 1913. In July of 1916, Harold enlisted in the Canadian Army. He suffered from gunshot wounds which fractured his left leg at Cambrai on October 1, 1918. This injury caused a shortening of his left leg, which in turn resulted in lameness. During World War II, Harold served in the Veterans Guard. 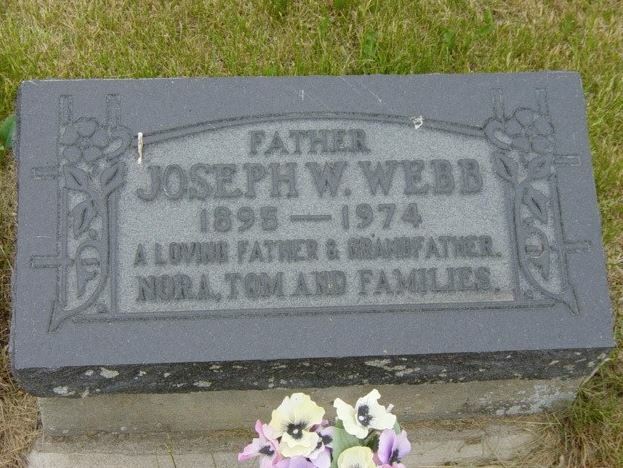 He died on January 10, 1951 and was buried in the Grande Prairie Cemetery. James was born in Brant Township, Ontario on August 20, 1871. 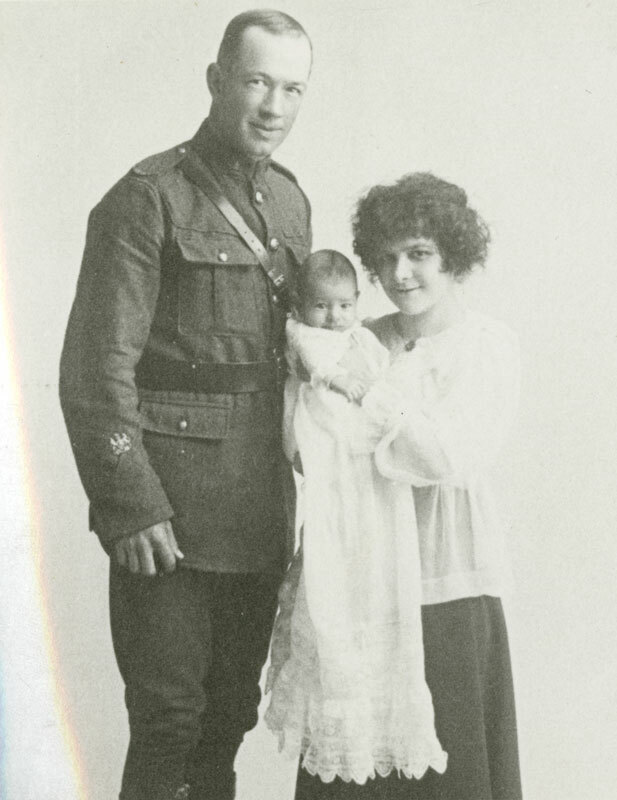 At the time of his enlistment, James, Margaret, and their three children were living in Wainwright, AB, where James worked as a sawmill foreman. He served only in England with the Canadian Forestry Corps. His eldest son James also served in the Canadian Army. According to the homestead records, James filed on SE 33-77-3-W6 in December of 1918. Joshua was born in Huron County, Ontario on January 3, 1883. 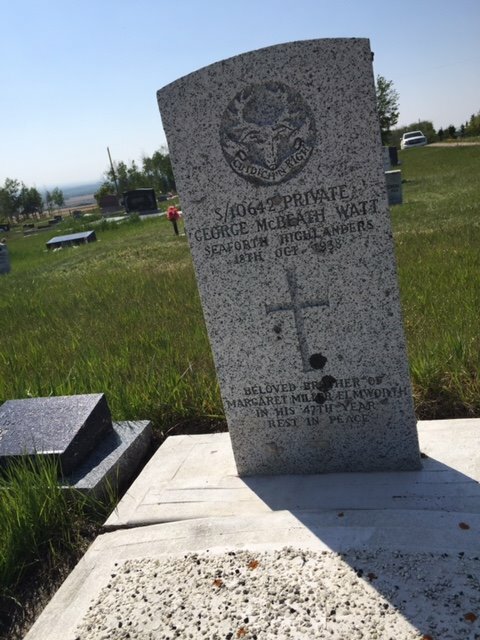 He was living in Wetaskiwin, Alberta at the time of his enlistment in November of 1914. In November of 1917, Joshua was invalided to Canada, having been found medically unfit due to rheumatism/myalgia. He was officially discharged on February 13, 1918. In the spring of 1919, Joshua filed on the eastern half of 3-78-2-W6 in spring of 1919. He died on April 18, 1952. Frank was born ca. 1890 in Franklin, Kentucky. It is likely that he served in the American Army. In 1919, Frank filed on the southern half of 17-72-26-W5. Michael was born in Huns Valley, Manitoba on November 20, 1889. In 1914, he filed on a homestead at SW 16-73-5-W6. Michael was drafted in June of 1918. Because it was so near the end of the war, he only served in Canada. After being discharged, he sold his land and left the area. Harry was born in Thedford, Lambton, Ontario on December 22, 1891. He apprenticed as a watchmaker for three years in Parkhill, Ontario, then came to Edmonton to work for his brother in 1910. In 1915, after working in various other Alberta locations, he came north and established his business in Grande Prairie. He filed on NE 33-70-6-W6 and NE 13-72-12-W6. In 1916, Harry enlisted in the armed forces, having sold his business to C.S. Hook. He served only in England. After being discharged, Harry returned to Grande Prairie. On December 31, 1926, Harry married Nora May MacEwen, who had come to work for lawyer George Fraser. In 1965, Watcher retired and sold his business to Stewart E. Curry, who built his new Curry’s Jewelers on the site of Watcher’s store. Harry died in 1979 at age 88. Tom was born in Romsey, Hampshire, England on June 17, 1885. It is uncertain when he immigrated to Canada. In December of 1914, Tom enlisted in the Canadian Army in Brandon, Manitoba. He married Isabel C. on June 22, 1915. In 1930, he filed on a homestead at SE 12-71-7-W6. Olive was born in Hinckley, England. As a young woman, she received training as a nurse and midwife. Early in World War I, she joined the Queen Alexandra's Imperial Military Nursing Service. Olive served as a nursing sister at a Casualty Clearing Station in France; she was mentioned in dispatches several times in 1918. In 1921, she came to Canada and joined the Alberta Department of Health. She was appointed a district nurse at Halcourt. In 1924, the Department of Health formed the traveling Clinic; Olive accompanied the traveling clinic for eleven years. When World War II began, Olive was on holiday in England and offered her services as a nurse and midwife in London. She resumed her work as a district nurse when she returned to Alberta. In 1950, she retired and moved to Victoria. Olive died on November 29, 1969. Finlay was born in Belfast, Ireland on September 16, 1891. His parents immigrated to Canada with their nine children in 1908; Finlay filed on homesteads at NE 9-71-8-W6 and NW 33-70-8-W6 in 1910. In August of 1915, Finlay enlisted in the Canadian Army. His brother Robert also served during World War I. Finlay received a bayonet wound to his right leg at Vimy on April 30, 1917 when he went over the top and landed on a spiked bayonet (see his June 1917 letter for more details about the injury). He also suffered from accidental abrasions to his face and hands in August of 1917. Finlay's wife was named Mabel. 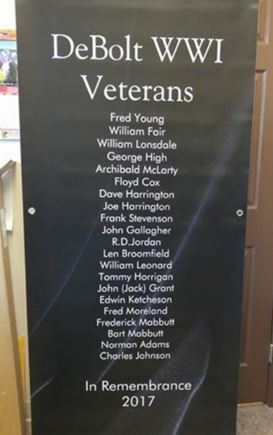 During World War II, Finlay served with the Veterans Guard at a POW camp in Lethbridge. He died there on February 2, 1945 and was buried in the Lake Saskatoon Cemetery. Reid was born in Portage la Prairie, Manitoba on June 25, 1893. In 1913 he came to the South Peace and filed on the northern half of 27-78-6-W6 as well as SE 23-78-6-W6. Reid enlisted in the Canadian Army in January of 1916. He died of wounds received at Courcelette on September 16, 1916, at the 6th Canadian Field Ambulance. A memorial service was held in Spirit River on October 1, 1916. Reid was buried at the Albert Communal Cemetery Extension in France. Robert was born in Dundonald, Ireland on July 16, 1896. His parents immigrated to Canada with their family of nine in 1908. In March of 1916, Bert enlisted in the Canadian Army; his brother Finlay also served during World War I. Bert was awarded the Military Medal. In 1920, he filed on land at NE 32-73-12-W6 and NW 33-73-12-W6. He was Lake Saskatoon's first village secretary. Bert died on November 30, 1974 and was buried in the Lake Saskatoon cemetery. Thomas was born in Calcutta, India on January 19, 1890. In 1910, he filed on land at NE 27-72-8-W6, NE 24-71-6-W6, and NW 22-70-5-W6. Thomas enlisted in the Canadian Army in July of 1915. In October of 1917, he was gassed and in hospital until January 1, 1918. George was born in Thurso, Scotland in 1891. He served in France and Mesopotamia during World War I. In 1920, George traveled to Canada with his sister Margaret; he filed on a homestead at SE 9-70-11-W6. George died on October 18, 1938 from illness or injuries that had resulted from his military service. He was buried in the Halcourt cemetery. James was born in Aberdeenshire, Scotland on June 16, 1881. In 1911, he filed on 8-72-10-W6 (the entire section). James enlisted in the Canadian Army in July of 1915. The following year he went missing in action; James was reported to have died on June 6, 1916. He is commemorated at the Ypres (Menin Gate) Memorial. Alan was born in Folkestone, England on September 17, 1898. He attempted to join the army at the age of 15 but was turned away. He tried again the following year and this time was sent to Italy and France. After being gassed and buried, Alan was invalided home. He spent the next few years traveling in Canada and South Africa; after coming down with enteric fever, he left Africa. In 1922, Alan filed on the eastern half of 14-70-8-W6. On June 18, 1923, Alan married Selina Cave-Browne; they had two daughters. Both Along the Wapiti and a biography in the surname file contain many interesting stories about their life together. Alan died on March 18, 1957. William was born in Islington, England on June 11, 1860. In 1879, he was a bugler with the Imperial Forces in Bermuda. It is unknown when William came to Canada. 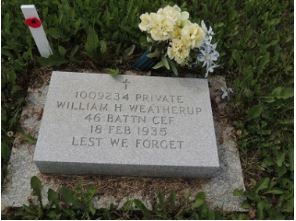 William enlisted at Valcartier in September of 1914 and served in England. He spent a lot of time in hospital and was sent back to Canada in July of 1917. William moved to Grande Prairie with his two daughters; he taught music lessons and played the organ at the Anglican church. His son, Harry Temple Watts, visited him here; Harry also served in Canadian Army. In 1918, William filed on SW 23-71-8-W6. He later moved to Edmonton, and eventually to Victoria. William died in Victoria in May of 1938. William was born in Roseneath, Ontario on June 3, 1892. He enlisted in the Canadian Army in December of 1915. On August 10, 1918, William suffered from gunshot wounds to his chest (his service file contains some unusual medical diagrams). He married Rachel Labatt in Hazelmere in 1931. They had two children. William died suddenly of a heart attack on February 18, 1935. Charles was born in Bristol, England on December 7, 1893. He was living in Red Deer, Alberta when he enlisted in the Canadian Army in January of 1915. Charles was awarded the Military Medal on July 9, 1917. He fractured his right ankle in May of 1918 while wrestling; his service file has an x-ray showing this injury. In 1919, Charles filed on NE 18-71-3-W6 and SE 19-71-3-W6. He married Katherine on March 24, 1924. The couple moved to Victoria in their retirement. Charles died in Victoria on August 17, 1974. George was born in Greenwich, England on December 28, 1892. In 1913, he filed on land at NW 35-70-11-W6 and NW 15-74-4-W6. George traveled to Edmonton to enlist in the Canadian Army on his birthday in December of 1915. On April 26, 1917, George received shrapnel wounds to the left side of his chest and left lung; he died of these wounds three days later. He was buried at the Barlin Communal Cemetery Extension, and his headstone is inscribed with "May his reward be as great as his sacrifice." Joseph was born in Bedfordshire, England ca. 1895. He came to Canada as a young man, but returned to England to join the army at the beginning of World War I. After the war, Joseph returned to Canada. He met and married Gladys ca. 1930. They moved to Grande Prairie with their family in the 1940s. George died on January 8, 1974 and was buried in the Lake Saskatoon Cemetery. Born ca. 1894 in Greenwich, England. Thus far, we have been unable to find a military service file to confirm Richard's identity. Jacob was born on March 7, 1885 in Little Falls, Minnesota. In 1911, he filed on land at SW 18-72-4-W6 and NW 7-18-72-W6. He was drafted into the Canadian Army in November of 1917. Jacob returned to the South Peace after the war, and lived on his farm until he retired to Grande Prairie in 1958. Jacob died on February 14, 1975 and was buried in the Grande Prairie Cemetery. William was born in Orangeville, Ontario on December 26, 1876. He was married to Olivia Kate and they had two children. The family came to the South Peace in 1915, and William filed on a homestead at NW 26-70-12-W6. In July of 1916, William enlisted in the Canadian Army. He was on extended leave to Canada beginning July of 1917. William died on April 18, 1958. William was born in Glasgow, Scotland on May 3, 1887. In 1915, he filed on LT 17-78-5-W6. William traveled to Edmonton in March of 1916 to enlist in the Canadian Army. On August 15, 1917, he was reported missing in action. William was later reported killed in action. Ogden was born in Ashland, Ohio on October 12, 1882. In 1914, he filed on land at SE 34-78-15-W6 and NW/SE 6-71-5-W6. Ogden was drafted into the Canadian Army in March of 1918. He served only in England. After the war, he married a woman named Ethel. Ogden died on December 3, 1938 and was buried in the Grande Prairie Cemetery. Edward was born in Dundalk, Ontario on October 9, 1895. At the age of 18, he came west to the Peace River country and filed on a homestead at SW 26-72-6-W6. He was drafted into the Canadian Army in June of 1918; his brother Harold also served. Because it was so near the end of the war, Edward served only in Canada. He returned to Grande Prairie after the war, but moved to Edmonton in 1923. Harold was born in Dundalk, Ontario on October 19, 1896. He enlisted in the Canadian Army in Moose Jaw in September of 1915. On September 3, 1916, Harold was dangerously wounded at the Somme (Mouquet Farm). He suffered from shrapnel wounds to the left side of his face, and was in hospital until he was invalided to Canada in June of 1917. The injuries caused vision problems in Harold's left eye, and hearing problems in his left ear. He also had trouble eating and suffered from headaches. A note in his service file dated May 1917 stated that "the board recommend that he be invalided home without delay. Harold was discharged on October 31, 1917. He came to the Grande Prairie area, where his brother Edward was homesteading, and filed on land at NE 12-73-5-W6. Harold died on September 19, 1949. Roy was born in Johannesburg, Michigan on June 10, 1886. In 1914, he filed on a homestead at SE 27-77-6-W6. He was living in Spirit River when he was drafted in 1918. Herman was born in Dresden, North Dakota on January 22, 1884. He was living in Ashmont, Alberta when he was drafted into the Canadian Army in January of 1918. Around 1927, he moved to the Grande Prairie area. Herman married Lottie Benn in July of 1928; they had ten children. He died in 1967. Heber was born in Abingdon, Berkshire, England on June 26, 1886. In 1910, he filed on NW 10-71-8-W6 and NE 33-70-8-W6. Heber enlisted in the Canadian Army in July of 1915. He was married to Vicky Lawrence. Edgar was born in Bradenham, Norfolk, England on September 7, 1878. He came to Canada in 1910. In 1912, he married Maud in Virden, Manitoba, where they were still living at the time of his enlistment in January of 1915. On April 9, 1917, Edgar received shrapnel wounds to his left thigh (shell explosion at Vimy Ridge). He was invalided to Canada in August of 1917; he had a limp, but it was caused more by myalgia than the wound. According to his service file, Edgar also suffered from mild shell shock. In 1930, Edgar and Maud sold their Manitoba farm and moved to Hythe; they filed on homesteads in west Goodfare in 1937. Edgar died on January 10, 1947 and was buried in the Grande Prairie Cemetery. Michael was born in Switzerland ca. 1879. After a great deal of travel, he settled in Saskatchewan for a time. In 1911, he came up to the South Peace and filed on the northern half of 14-71-10-W6 and the southern half of 23-71-10-W6. After proving up, Michael served with the Edmonton police force. Michael had a great aptitude for languages, and served as a translator and interpreter for at least ten languages during World War I.
John was born in Zurich, Switzerland on May 20, 1896. It is unknown when he first came to Canada, but he enlisted in the Canadian Army in Vancouver in January of 1917. John served only in England. In 1919, he filed on SE 21-76-21-W5, though he later canceled this homestead. In 1929, John filed on the northern half of 21-76-21-W5 and this time proved up. Gordon was born in Aberdeen, Scotland on February 24, 1892. In 1914, he filed on a homestead at NE 20-71-8-W6. He enlisted in the Canadian Army in July of 1915. Gordon was killed in action on September 8, 1916. Austin was born in Battleford, Saskatchewan on January 12, 1900. When he enlisted in the Canadian Army in April of 1917, he lied about his age and said he had been born in 1899. In 1921, after returning from overseas, Austin married Mary Ray. They had two children. In 1922, Austin filed on land at SW 1-71-10-W6 and NW 6-72-10-W6. Austin died in Hythe in 1993. Walter was born in Redruth, Cornwall on May 29, 1882. He served in the Royal Navy for twenty-five years. In 1926, Walter and his wife Annie immigrated to Canada with their nine children, aged 3 to 17. He filed on land at 4-72-12-W6 and 31-71-12-W6. Annie died following a major surgery in Edmonton in March of 1927, only seven months after the family arrived in Canada. 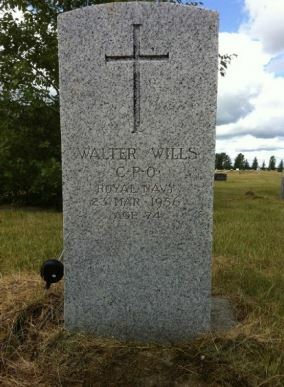 Walter died on March 23, 1956 and was buried in the Hythe Cemetery. Andrew was born in Ottawa County, Quebec on June 23, 1893. He filed on a homestead at SW 26-71-7-W6 in 1914. In July of 1918, Andrew was drafted into the Canadian Army. On December 19, 1918, Andrew was admitted to a military hospital in Calgary, having been diagnosed with influenza. He died the following day at 9:10 PM and was buried in Mount Pleasant Cemetery in Edmonton. Arthur was born in Manitoba on April 8, 1897. He filed on a homestead at NE 33-70-6-W6 in April of 1916; a week later, he enlisted in the Canadian Army. Arthur suffered from gunshot wounds to his right shoulder and hand in October of 1918. Fred was born in Wright County, Quebec on June 14, 1895. In 1913, he filed on a homestead at NW 1-72-6-W6. In 1918, Fred was drafted into the Canadian Army. According the August 27, 1918 Grande Prairie Herald, he was given six week harvest leave. Fred was married to Beatrice Lily Broadribb. He died in October of 1985. Gordon was born in Stratford, Ontario on April 4, 1887. He settled in the Spirit River area in 1914 (LT 33-78-6-W6) and filed on a second quarter at SE 21-77-6-W6 in 1919. In January of 1916, Gordon enlisted in the Canadian Army. He suffered from trench fever in April of 1917, and also was knocked down by a shell that burst near him. On September 27, 1918, Gordon received gunshot wounds to his left thigh. According to his medical records, he also suffered from flat feet and myalgia. After returning to Spirit River in 1919, Gordon married Mava Foster. They had four children The family moved to California in 1936. Gordon died in 1979. Paddick was born in Birnie, Manitoba on January 20, 1890. At the time of his enlistment in August of 1915, he and his wife Leona Helen were living in Eyebrow, Saskatchewan. Paddick suffered from multiple severe shell wounds on April 11, 1917 at Vimy Ridge. He was invalided to Canada in December of 1917 because of gunshot wounds to his right leg. See pages 69 and 73 of his service file for xrays, and a report about the "foreign bodies" on page 70. Paddick was discharged on August 27, 1918. It is unknown when Paddick and Leona came to Grande Prairie. Paddick died on May 7, 1953 and was buried in the Grande Prairie Cemetery. Ralph was born in Arthurette, New Brunswick on June 27, 1894. He filed on a homestead at NW 5-72-3-W6 in 1913 (he later filed on land at NW 31-71-3-W6 and SW 1-73-3-W6 as well). In June of 1915, Ralph enlisted in the Canadian Army; his brother Bill also served. On September 28, 1916, Ralph received shrapnel wounds to his right knee. His knee cap had to be removed to extract the shrapnel. In March of 1917, Ralph was invalided to Canada, and a note in his service file dated June 1917 stated that he was quite capable of walking 5 miles. He was discharged on August 5, 1917. On April 5, 1916, Ralph married Laura Winship in Edmonton. They had six daughters. In 1933, Ralph and Laura moved to Vancouver. Ralph was married a second time to Doris Beale. He died on September 3, 1983. Bill was born in Victoria County, New Brunswick on November 23, 1887. In 1913, he filed on a homestead at NE 5-72-3-W6. Bill enlisted in the Canadian Army in June of 1915; his brother Ralph also served. On March 1, 1918, Bill received gunshot wounds to his right thigh while fighting at Lens. Bill died in Vancouver on July 20, 1967. Louis was born in Monett, Missouri on May 7, 1894 (1896?). He filed on NE 33-72-4-W6 in 1914. In June of 1918, Louis was drafted into the Canadian Army. Because it was so near the end of the war, he served only in Canada. Louis returned to his homestead after the war. On April 22, 1929, he married Esther Maude Swift. They had five children. Louie died on October 31, 1975 and was buried in the Grande Prairie Cemetery. Charles was born in Hanwell, England on April 28, 1884. His wife Sarah and daughter Priscilla came to the South Peace in 1917, where Sarah filed on NW 25-71-9-W6 (proxy for Charles). Charles had enlisted in the Canadian Army in September of 1915. His brother Edgar also served in the Canadian Army. According to his medical records, Charles suffered from pleurisy in 1916. Daughter Priscilla died in 1921 at the age of 8 and was buried in the Mountain Side Cemetery. Charles's service file indicates that he was living in Ontario in 1922. He died in Ontario on September 24, 1972. Edgar was born in Hanwell, England on March 8, 1887. His father died when he was quite young, so Edgar was sent to live in a Barnardo Home. At the age of 5, he was sent to a foster home in Canada. Edgar first came to the Peace Country just before World War I, as his brother Charles and his family were already living here. Edgar enlisted in the Canadian Army in January of 1916. On October 13, 1916, he suffered from a contusion to his knee. He returned to the South Peace after the war and in 1921 filed on the eastern half of 13-70-8-W6. On August 1, 1929, Edgar married Jean Rainey Whyte. They had three daughters. In the 1950s, Edgar and Jean retired to Grande Prairie. Edgar died on November 22, 1968. Frank was born in Rochester, England on February 11, 1887. He came to Redwater, Alberta in 1905, and was living in Fort Saskatchewan at the time of his enlistment in February of 1916. Frank was discharged on April 15, 1916 because of a foot deformity. In 1927 he moved to Rocky Mountain House. He married Edith Sanderson in 1929. They later moved to Hythe. Frank died in Beaverlodge on February 26, 1990. Elmer was born in Ontario ca. 1894. He filed on SW 8-72-4-W6 in 1913. In the winter of 1917, Elmer joined the Royal Air Force. He died in a plane crash in Deseronto, Ontario on September 16, 1918 and was buried in Colville, Washington. Horace was born in Chicago, Illinois on February 22, 1890. He enlisted in the Canadian Army at Vernon Camp in May of 1915. Horace was gassed on July 26, 1917. Around August of that year, he was married to an Englishwoman named Teresa Gay (on July 6, 1916 he had changed his will to leave everything to his friend, Miss Teresa Gay). Horace fractured his fibula on August 18, 1918. In 1930, Horace and Teresa filed on the southern half of 17-79-12-W6. Alexander was born in Midland, Ontario on March 22, 1884. He enlisted in the Canadian Army in Lacombe in April of 1916. On April 22, 1917, Alexander received shrapnel wounds to his face and left foot. He was married to an Englishwoman in 1919; they returned to Canada after the war. In 1930, they came to the South Peace and filed on land at NE 8-79-12-W6 and NW 9-79-12-W6. Alexander died on June 20, 1969 in Kelowna. Elizabeth was born in Big Island, Pictou County, Nova Scotia on October 21, 1885. She enlisted as a nurse in the Canadian Army in May of 1917. Elizabeth served in France at the No. 2 Canadian Stationary Hospital from July to December of 1918 (the hospital was located at Le Touquet or Outreau in France). In 1921, she came to the South Peace with three other nurses and filed on SE 6-78-4-W6. In 1924, Elizabeth married Louis Young, a local farmer. They had no children. Elizabeth died in Spirit River on September 28, 1973. Fred was born in Lac La Biche, Alberta on August 24, 1885. As a young man, he worked on the survey of the Northern Alberta Rail. It was at this time that he first came to the South Peace. In November of 1914, Fred enlisted in the Canadian Army. In September of 1916, he received shrapnel wounds to his right ankle. Fred was gassed on August 18, 1917 at Hill 70. He also suffered from multiple severe shrapnel wounds (chest, arm, legs, hand, and shoulder) in October of 1917 at Passchendaele; as a result of these wounds, Fred suffered from tetanus. He had only been back on duty for two days after the Hill 70 injury when he was wounded at Passchendaele. In January of 1918, Fred was awarded the Military Cross and, on January 18, was promoted to Lieutenant. In August of 1918, Fred's right leg was amputated. X-rays are available on pages 119, 121, and 123 of his service file. When Fred returned to Canada, he traveled back to the South Peace and filed on land at NW 1-71-24-W5 and the eastern half of 2-71-24-W5 (1920). Around 1920, he married Jean Hopkins. In 1968, Fred and Jean retired and sold their homestead to the government to use as a park (Young's Point Provincial Park). Fred died on September 12, 1971. Scotty was born on September 9, 1897 in Caithness, Scotland. In 1915, he enlisted in the British Army at Beauly, Scotland. Scotty received shrapnel wounds to his knee in January of 1917. After several months in hospital, he returned to the front in September of 1917. In October of 1918, Scotty went back to Scotland on furlough; in April of 1919, he was discharged. Scotty came to Canada in May of 1920; in 1929, he came up to Spirit River. In 1933, Scotty filed on SW 20-80-8-W6. In 1979, Scotty sold his land, though he remained in the South Peace. Roland was born in Nottingham, England on June 20, 1895. It is unknown when he came to Canada, but he enlisted in the Canadian Army at Valcartier in September of 1914. Roland received gunshot wounds to his thigh in April of 1915, and slight wounds to his arm in July of 1916. In August of 1916, Roland was awarded the Military Medal for bravery in the field. In 1918, he received gunshot wounds to his right shoulder. According to his service file, Roland married Sarah Inwood ca. November 1918. After the war, they came to the South Peace and filed on the southern half of 22-70-9-W6. Roland and Sarah welcomed a daughter on June 2, 1920. It is unknown whether Roland and Sarah divorced, or Sarah died, but on July 5, 1933, Roland married Winona Howell, school teacher. He once again served in the Canadian Army during World War II. This left Roland with health problems, forcing them to sell the farm and move to Grande Prairie. While visiting family in London, Roland suffered from a heart attack and died on October 29, 1961.